Skills and abilities: An accomplished hunter and tracker. Able to survive in the wilderness of Australia unaided. He is also skilled with weapons such as the spear, bow and arrow. He received additional hand to hand training while a member of Nick Fury’s Secret Warriors. Powers: Using his hands he can mold reality to tear open space and time connecting one place to another thus allowing him to teleport to just about anywhere [Secret Warriors #4]. He does not have to know where he’s going as his powers compensate and allow him to never materialize inside of an object. Unlike other teleporters but similar to Gateway, his portals remain open until he closes them. 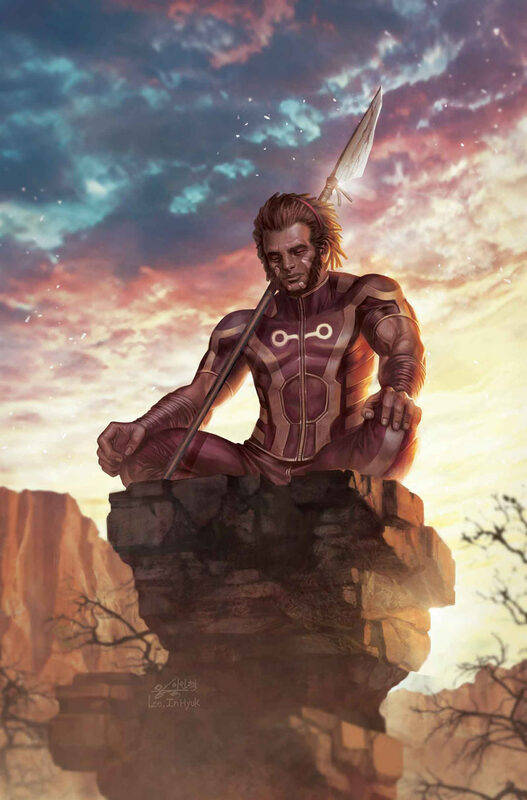 Nothing is known of his childhood except he was an Aborigine, perhaps he was from the same tribe as the mutant Gateway, or his tribe simply knew of him. Gateway was a one time member and ally of the mutant community’s X-men and Generation X. Upon manifesting his powers he was sent to the elder Gateway to learn the proper use and application of said powers. 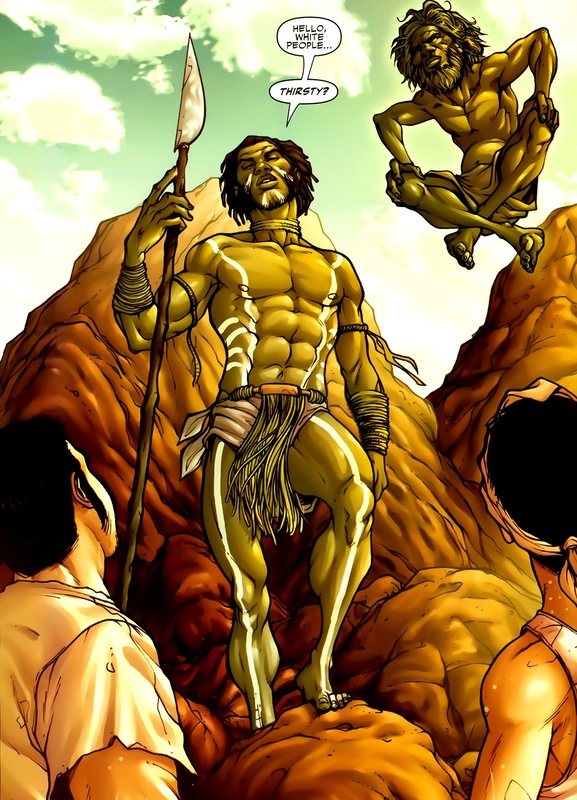 Despite his aboriginal upbringing however he had dreamed of being a famous rock star and a lead guitarist [Secret Warriors #4]. As time passed however he resigned himself to his life knowing that nothing more would ever become of him. The possibility came up however when Gateway informed him that a team working for Nick Fury would be coming to recruit him. Gateway, however flat-out denied him the right to leave much to his dismay [Secret Warriors #4]. He later accompanied Gateway in rescuing some of the secret warriors who had come to recruit him but crashed in the Australian outback [Secret Warriors #4]. Strange enough Gateway allowed him to go noting that he was to be a part of a second team of Secret Warriors and that he would be protected there by its female leader [Secret Warriors #4]. Once out of his native clothes he was at ease and bonded easily with his new teammates. His carefree attitude and personality make him a welcome addition to the once somber team. During his first mission the team manages to save Nick Fury and the Hellicarier from Hydra [Secret Warriors #5-6]. He remained with the team and trained until they were called back into action against “Leviathan”. He was teamed with the son of ares [Secret Warriors #13]. On another mission to a Hydra base he was the only means of infiltration and escape but was rendered unconscious [Secret Warriors #20]. While unconscious two of his friends were killed [Secret Warriors #21-22]. After this his team became more militant until Nick Fury disbanded the team [Secret Avengers #24-28]. After the apparent death of his mentor Gateway he returned to Australia where he was approached by Captain America and Iron man to join a new global branch of the Avengers alongside members such as Falcon, Sunspot and Captain universe [Avengers (2013) #1–#2]. On the teams first mission he was instrumental in transporting them to Mars to battle Ex Nihilo, Abyss and Aleph [Avengers (2013) #2–#3]. He also participated in the battle against Nightmask and Starbrand [Avengers (2013) #9]. At the onset of Infinity he saves many lives by using his powers [Avengers (2013) #14]. Before being taken into space by Captain universe who reveals to him that the builders were on their way to earth and the Infinity Event was about to occur [Avengers (2013) #15–#16]. Upon returning to earth he found the Avengers defeated and single handedly take on and defeats the Hydra agents responsible [Avengers (2013) #17]. He then warns them of Infinity and the team leaves Earth to stop the threat from reaching earth [Avengers (2013) #18]. When half the team is captured he is a part of the rescue squad [Avengers (2013) #20]. After the defeat of the Builders he is a crucial component to getting the Avengers back to Earth in time to face Thanos [Avengers (2013) #22-23]. All of the stories he’s been in, and a blue chip rookie on the Avengers, and this is the first I have heard of him. True, I don’t buy like I used to, but I haven’t seen him on ANY review sites. We can get a million articles about a new Batgirl costume, but no word about a cool new Avenger.